One double bedroom with king size bed. New Italian furniture: tables, cabinets, plasma TV with Russian channels. Living room with plush sofa, plasma TV, dining table with chairs. Terrace with garden furniture and a small garden at the entrance. Equipped kitchen: kitchen set, electric oven, extractor, kettle, crockery, fridge. Bathroom with shower, new fixtures. a Wonderful opportunity to rent an apartment in Phuket with panoramic views of the sea, the Karon NG! Featuring: gym, swimming pool, satvas to Karon beach, restaurant. the price includes: cleaning, change of linen and towels twice a week, Internet, cable TV, services satvata to Karon beach. Paid separately: electricity (8 baht per unit) and water(25 baht per unit) with monthly rentals. 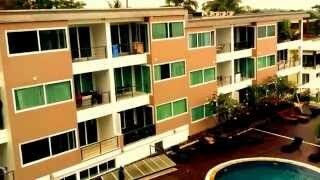 Karon Butterfly is a 5-minute drive from Karon Beach and Karon Plaza. It offers spacious suites with balcony and kitchen. The property features a pool and laundry service. Free Wi-Fi is available throughout. The prorperty is a 25-minute drive to Patong Beach and downtown Phuket. It is a 45-minute drive from Phuket International Airport. Each suite has a dining area and living room. It comes with a flat-screen cable TV and safety deposit box. Shower facilities are included in an en suite bathroom. One bedroom apartment in a new condominium in Rawai area.